Click image to expand and read. After publishing The Last Will & Testament of Zelda McFigg, a funny novel about a 4'11", 237 pound woman with a habit of lying, burgling, and incinerating houses--a woman desperate to be seen and accepted for her talent and inner beauty--I became a little desperate to read funny novels about other difficult women. There are not a lot of them. But here's what I found. Funny, well-written literary works with original voices, they are books with big fat arms and legs, irregularly shaped real-woman bodies ... and teeth. Enjoy. A postscript: There is one more book I would have added to this list had I read it by the article's deadline--Eggshells by Caitriona Lally. Read my review on the link. 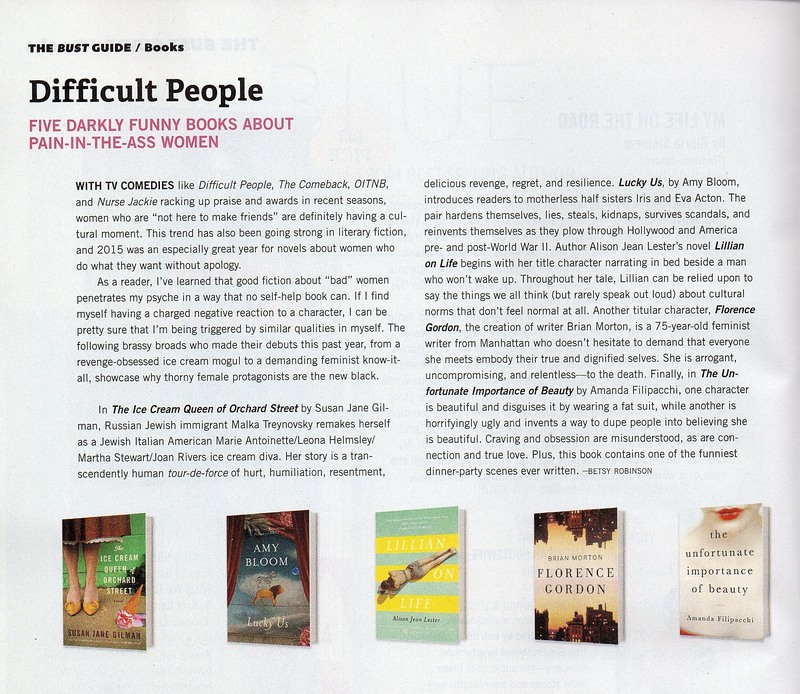 The article appears in the December/January 2016 issue of BUST magazine. Query: For a possible follow-up article, I would love to hear about any other books that fall into the "funny literary fiction about difficult women" category. Specifically, well-written, well-edited, well-published funny fiction written in an original voice. Although there are many examples of good comedy that is glib, slick, or trendily caustic, this is not what I'm looking for. I'm looking for literary fiction written today that will be good in any era. Stories about real, flawed, not necessarily likable grown-up women. You can suggest them in comments or email me at Betsy@BetsyRobinson-writer.com. Thanks. My bc might be very interested to have you visit. I will check out the book and spread the word with the other ladies. We actually had Jamie Brenner come when I won copies of The Gin Lovers on Book Movement!